Rangoli, also known as kolam or muggu is a folk art from India. It is usually made during Diwali, Onam, Pongal and other Indian festivals. Typically consisting of bright colors, rangoli is a decorative design made in living rooms and courtyard floors during Hindu festivals . They are meant to be sacred welcoming areas for the Hindu deities. The ancient symbols have been passed down through the ages, from each generation to the next, keeping both the art form and the tradition alive. The patterns are typically created with materials including colored rice, dry flour, (colored) sand or even flower petals. Similar practices are followed in different Indian states: in Tamil Nadu, there is Kolam in Tamil Nadu; Mandana in Rajasthan; Chowkpurna in Northern India; Alpana in West Bengal; Aripana in Bihar; Chowk pujan in Uttar Pradesh; Muggu in Andhra Pradesh and others. Rangoli designs can be simple geometric shapes, deity impressions, or flower and petal shapes (appropriate for the given celebrations), but they can also be very elaborate designs crafted by numerous people. The base material is usually dry or wet granulated rice or dry flour, to which sindoor (vermilion), haldi (turmeric) and other natural colors can be added. Chemical colors are a modern variation. 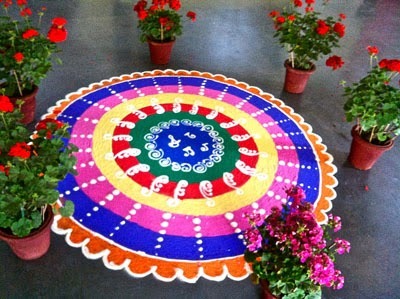 Other materials include colored sand and even flowers and petals, as in the case of flower rangolis. These patterns are normally called "Kolum." O sounds like Oh. U sounds like bun. Kohlum. When the symmetrical pattern is decorated in colors using colored sand or flower, then it is called rangoli. The design or pattern is not symmetrical sometimes, but it is just a continuous line that curves around to make a beautiful border or design at the Center of the yard. . The threshold desing is compared to African sand drawings. These patterns or designs were created in the olden days (according to Tamil literature) using rice flour. Holding a handful of flour in their right hand, the woman will uniformly drop the flour to make a line through her thumb and pointer and keep on moving her hands to make the curve or the dots. Nowadays, women use powder made out of stone. (Stone is crushed and sold commercially). The patterns are very complicated and huge during festival months. The temples will have complex patterns that will cover thousands of square feet. Sometimes, several women together will create one large design. Onam is a harvest festival celebrated in Kerala, India. It is the harvest of paddy. The legend has it that the great king Mahavali was so generous that he almost gifted anything any one asked. The gods in heaven got scared that he may become the king in the heaven. So, they requested Lord Vishnu to get rid of him. Lord Vishnu in the shape of a dwarf (Vaman incarnation) requested for three steps of land. Mahavali immediately donated without knowning its implication. Vishnu put one foot on the ground that covered the earth, the second foot occupied the sky and there was no place for the third step. Vaman, therefore, offered his own head and Vishnu pushed him down into the Nerherland. However, Mahavali was loved by everybody for his good nature and virtue, and returns to earth on the day of Onam. Onam is celebrated for 10 days. People don new dresses, prepare lovely dishes, eat on banana leaves and young girls make flower designs like carpets to welcome King Mahavali. 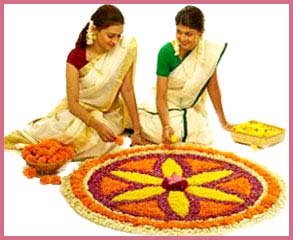 The flower arrangements for 'rangoli' during Onam are the highlight of the artistic minds of the pretty Kerala girls.
. Festivals of India .
. Diwali, Divali , Devali .